Such problems have been solved. We've also fixed some issues with OnePayment. We add a new core feature that can help you handling fraudolent orders. More in particular it lets you postpone the issue of invoices for new customers (ones with no invoices issued on their accounts) so that you can manually review them later on. Read documentation for more details. New feature for Italian customers that use electronic invoicing with VAT MOSS regime. Billing Extension already handles this process but we do understand that this particular scenario is a bit complicated to configure. In this release we add a simple toggle that lets you enable or disable MOSS in line with electronic invoicing. This release contains a fallback to handle a particular scenario occurring with OnePayment. If you use this Billing method we encourage you to update the module. A long-awaited feature is finally being added. You can receive an email notification everytime there's an update available for Billing Extension. You can specify who receives it. Keep in mind that the email will be sent directly by your own WHMCS. This new feature can be configured from Utilities section. As for electronic invoicing the module now logs when customers update their business type. This way you can monitor changes to billing details. With this release we introduce a new mode for Electronic Invoicing that allows to perform actions that normally would be restricted. For example from now on you can delete XML files that have been already marked as sent to Revenue Agency. Please use it very carefully. The button dedicated to Electronic Invoicing (Invoices page) now has a sub-menu to bring you a new feature that automatically scans your FTP Node to look for XML files that could be in the wrong place. You can now see Invoice Notes on the fly from Invoices page by clicking a new icon that automatically appears next to documents that have a note. Similarly we're integrated the standard Invoice Preview of WHMCS in Billing Extension. By clicking Total you will be able to see a preview of items and amounts without leaving the page. As for Electronic Invoicing we changed the value of IdFiscale for Extra-EU customers. It seems that Revenue Agency requires the value OO99999999999. We updated the module accordingly even though we can confirm you that basically any value is accepted. We don't get it but okay. Electronic Invoicing with FattureMyCloud integration. The status of a very small amount of XML files was "Unknown". This release will solve the issue with next cron job. This release solves the issue with daily Automated Tasks of Billing Extension. There's a new option for Electronic Invoicing that allows you to enable or disable the support for Invoice lots. Normally you should always prefer to generate XML files that contain Invoice lots but paradoxically some Intermediary platforms does not support this mode. If this is your case, make use of this option to save time and efforts. It is now possible to distinguish between XML files for single Invoices or Invoice lot from just looking at the new badge on Download Now button. Let's talk about (again) Canary Islands and more in general about VAT-free regions that always cause us many problems. Few weeks ago we introduced the possibility to specify state-based Tax Rates. For states like Canary Islands you simply had to set 0%. It gets the job done but everytime you come across Invoices with no tax applied and customers with Tax Exempt turned off, you need minutes to understand that it's all correct. In this release we want this process more comprehensible. 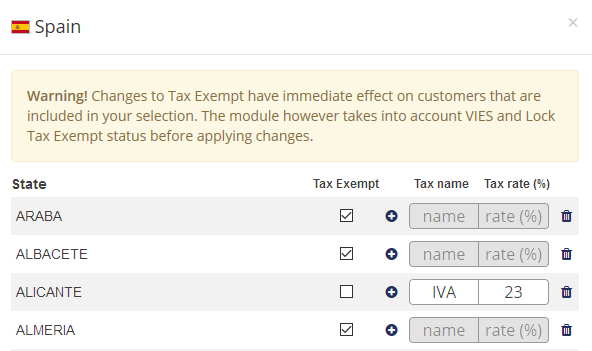 There's a new option that allows you to directly specify VAT-free States (preview). For example as soon as we set Las Palmas as VAT-free state, Billing Extension will automatically turn on Tax Exempt status for all the involved customers. Moreover such changes take into account VIES status and customers with Locked Tax Exempt. This way when you submit changes, you won't cause any hurt to customers with special rules applied. Of course changes will reflect on client registration and updates. In 2.2.43 we released the module as Bundle but in the end we've been forced to undo this change since there are still some customers running very outdated versions of ionCube. Similarly we tried to address an issue with Daily Cron Job of WHMCS and Automatic Tasks of Billing Extension. Some customer solved their problems but there are sill people experiencing issues therefore we keep investigating.